Fiona Harvey. – Be useful. The projects that I work on aren’t really projects in the technical sense. I like to think of them more as adventures into the unknown. They have a beginning and an end, but they don’t stick to specific milestones. Nothing is rigid and the work I am doing involves people, which means that anything can happen, particularly within higher education. However, I do get results, or rather ‘they’ do get results. This isn’t about me, it is about the students and how they manage their university experience. I am interested in how they bring together all the experiences that they have at university and how these translate into skills that they can use. A way of capturing all of this is through ePortfolios combined with Badges. You need both. Yes, yes, you do. The portfolio represents a bigger version of everything that the student is involved in, the badges are the specific sets of skills or activities, based around evidence, that capture what their contribution was. The use of Pathbrite combined with Badges is a project that will end in July 2017. This has been applied with Geography and soon, Social Sciences students. I’m supporting more and more interest in this combination of development and digital literacies skills as we move forward with this project but I hope that when it ends, that we can use this model to enhance more educational and research experiences in this innovative way. Edinburgh with the CRA in June was beautiful. So much culture. I love that they wanted to stay in the EU. I was looking for resources about Badges for the session I am running tomorrow with UG students from Geography. I gave the talk last year but this year I wanted to show the students what their Badge would look like and who else was issuing Badges. Last year, I could tell them about IBM, Samsung, City & Guilds and the NHS. I thought there must be more and there are. I discovered a wonderful site from the Scottish Social Services Council. Not only can you be issued a Badge through their site, but there is a webinar about Badges (and not just for Social Services practitioners) covering all aspects from what is a Badge, how they can be used, how to issue and even how to future proof your service. The webinar is a full 60 minutes but there is so much information and if you listen to the whole thing you can get a Badge. This is not a trivial, motivational use, in order to get the badge I need to say what I learnt from the webinar and how I will use it in my organisation. It made me think and listen. Awesome. It was refreshing to hear from an organisation with a practical, real-world use of open badges. In particular, my key takeaways are around usage and application. Robert Stewart sets out clearly how Badges (with evidence) can be used to evaluate events. I really liked the Bronze, Silver and Gold attendance badges. If you attended you get the Bronze (thats the hook to get you to see what a badge is) Silver attendance is what did you learn and plans for action, as well as sharing; Gold – having attended the conference or event, what have you done in your organisation. Then you have evidence of action as a direct consequence of your event and not via a survey but with evidence. It made my heart sing! I am going to take the idea forward of sharing. There is huge interest in the use of Badges to engage academically. In particular co-curricular activities and I will ask people that when they gain their badges to share what they have done. I really liked the use of # in the naming of the Badges. This also ties in with ePortfolios (inspired by Katie Coleman) where the evidence is part of a bigger picture of the online identity of the person. The application has been submitted! The Disruptive Media Learning Lab at Coventry University is one of those places that when you enter it you start saying “WOW”. I was there yesterday for their “Lost in Disruption Expo“, invited to give a keynote with Jacqui Speculand (raising her hand above) who is their Principal Project Lead. I met Jacqui when she came to Southampton University for our Open Badges in HE conference in March, although we had been in touch via Twitter we had never actually met before but our common interest in the use of Open Badges meant we had so much in common. I have to say something about their Lab space. On the top floor of their Lanchester Library (another link, we have a Lanchester building at Southampton University) named after Sir Frederick Lanchester an important engineer of his time and soon to be featured as part of a Heritage Funded project at Coventry University. This space is a complete conversion of the third floor of the library. As soon as you open the door you feel inspired to learn. It has that feeling of open space it is light and well laid out with jazzy spaces for sitting, I think they called it the “Google hill” a wooden tiered structure for sitting and holding talks. There are spaces for collaboration, sectioned off by huge whiteboards, tastefully designed and used by students all the time. I have created a little video about the space here. It is the sort of space that you are probably best describing with images so I’ll let that video speak for itself. One of the takeaways I had from the space was that it was well designed, well used and because of the light and the layout it made you want to learn. It is so true that your environment has a huge impact on how you feel and your behaviour. Part of the space belongs to the DMLL team. That is also a revelation. The team consists of Subject Librarians, Teaching staff, Education Developers, technical innovators, I call them that, they are not their real titles but they are not Learning technologists, they don’t look after a VLE and get people to use it. They are much more than that, the team is like an innovation engine, all working together, to explore ideas and get it right. Jacqui mentioned that it was a safe space to fail, somewhere to try out a concept, tweak it and adjust it before it is no longer a project, where is can be rejected or adopted by the university. You so need that. In addition to all of these people they had student interns working with them, and some of them they took on to be members of staff. The Expo itself was held in the space, ably Chaired by Helen Keegan. There are teaching rooms all round the edges of the space, some with glass walls and some as regular spaces but all have Apple TV, so the use of iPads to connect wirelessly is in place and has been for some time. Each of these rooms can be booked via the devices on the walls using Outlook as the booking system. No need to complicate it by using the regular university-wide booking system. We were talking in “The Grass” an intimate tiered space, covered in fake grass. It was a completely different experience to talk to 60 0r 70 people and being able to see all of them. People were not just sitting up, but they were relaxed and listening, genuinely listening, it was much more engaging to talk and listen here, again, because of the environment. Yes, we could have a room with 70 people in it. It is not the same, even the grass had something to do with it! The talks were excellent – I listened to Brian Lamb talking about how the VLE has been designed to put is into the silos that we are trying so hard to get out of. He also talked about “Splot“, a tool he has created to make it so much easier to write. He spoke of Sandstorm, a collection of open access apps that are a toolbox of web-enabled tools for academia. Jim Groom (DS106) talked about how we need to be more aware of how our data is used, he talked about lots of things including “A domain of ones own” project at University of Mary Washington to encourage academics to write more about their work so that they raise their academic profiles but they own their presence, and it is syndicated to the university. MOOCs and their corporatisation. And he showed us the “back to the future” 80’s console room. I could go on and on. Both Brian and Jim gave inspiring talks , I even listened to the podcast by Jon Udell on the way home on the train. There was so much to see and listen to I hope we can see it all again. I missed some sessions because I was preparing for my talk, but the tweets looked really interesting. They asked me what my takeaways were from the day and I said about the space because that just hit you as it was so different from the ‘usual’. But I also think that it is essential for progress and for the students to experience something like that. You need the space to explore and develop, and to meet the challenges of the new world of Higher Education. We can’t keep doing what we have always done. We will become irrelevant and students need to have the benefit of this in their own space before they face the real world. I hope that I can go there again and show others, and to work with the Innovation Engine that is the DMLL team. I’ve just got back from a week residential as part of my PhD with Lancaster University. I am part of Cohort 9 and although we have been discussing and talking together online since January, this was the first time that we met face to face. In the beginning we were all a little nervous, not sure what the week held, where we were going, but we would have a presentation on day 1 so we needed to get all of that behind us and get on with it. I was extremely excited about meeting everyone and to be learning new things over the week, I was also keen to meet some of the previous years cohort, including some who I already knew, which was also part of the residential. Day one came and I immediately felt like I had known some of them forever. Such a lovely, funny and very clever bunch of people. I learnt so much from them all. The week was set up to include social and academic activities, so after the first day of orientation and presentations in the pm, each morning we had a lecture with a member of staff or previous students on the programme. We would then look at various academic skills necessary for the programme and we had feedback on our research proposals. After listening to the speakers I found myself questioning what they were saying and applying perspectives that I hadn’t really thought much about before. I guess in my world, I’m just getting on with everything, but I now realise I can change things. I have an opportunity now to put some meat on the bones of the ideas that I had half formed in my mind and really push forward with digital literacies practices and challenge existing practice and beliefs. It was only when I was on the train home and looking at the literature that I needed for my research project that I realised how much I had learned. When I read one of the papers again, it made so much more sense and I think it was because of the jargon. Every community has their own jargon, whether you are in an institution or not, organisations, disciplines, etc all have a language that you use, that becomes familiar and it is not a barrier to learning. After the residential, reading a paper I was looking for certain things, structure, chains of evidence, theoretical frameworks, all of these things I had read about before but not really deep enough to sink in. But yesterday, on the train home, they did. I have been inspired to explore and challenge, and I am excited to be on this journey with everyone (<– that was soppy, sorry). As a student, I think Digital literacies skills are now more important for ever. Notably, I practice what I preach and this morning I have already been adding and responding to our Deep Space 9 (Cohort 9, see what we did there?) Group on Facebook, chatted via What’s App to Margaret (fellow member of Cohort 9) and now writing this post, whilst doing a Mooc with Udemy on Leadership. I’ve created a list via my Momentum chrome extension and am preparing further blog posts and a Keynote for next week, all of this will be recorded in my portfolio. So, onwards and upwards. Cohort 9, you are awesome and we’ve only just begun (cue The Carpenters here). I have signed up for Seth Godin’s Leadership workshop. A Mooc with Udemy. It’s actually more of an online course for lots of people. It wasn’t free, it was £13 (special offer, 83% discount) so I thought I’d give it a go. So each week I should be completing my leadership notebook, this week I have some question prompts to complete which I share on my blog. All good fun, and hopefully I’ll learn something along the way. 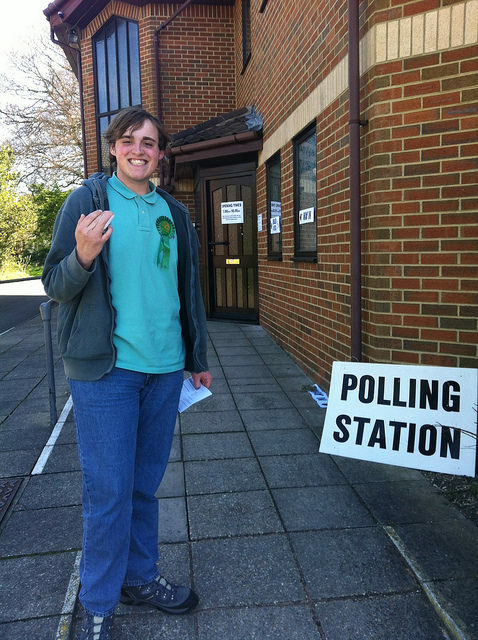 Miles voting for the first time – for himself! My son is now 21 and since he was 18 he has been encouraging and leading people to vote in local and national elections. He is a natural organiser and has been working tirelessly for the Green Party to encourage others to vote and to rally around and offer support. I was amazed that he was confident and willing to speak to the general public and he has inspired others his own age to stand for election and take an interest in local politics. I am always looking at new and hopefully innovative and useful ways for engaging with technology enhanced learning. One of the ways that I have shown leadership is leading by example. I am inspired by exploring and trying new ideas that I have read about or have experienced through talking to people or working with some amazing individuals, both students and staff. In terms of the difference between managing and leading, for me its more exciting to be leading a new initiative, although I do find encouraging and working with my iChamps great fun too. the difference is level of involvement and how much I can inspire while at the same time taking people forward. Is leadership a choice? er, yes. Why would you not want to lead something as opposed to managing someone elses ideas initiatives? Believing in the your work is a requirement to get anything to happen and why should anyone follow you if they don’t think that you can do it yourself? I hope I practice what I preach. What change do I hope to make? In terms of what changes I am trying to make, in terms of technology enhanced education, I am all about change for the better. Taking forward ideas that doing the same things the same way as we have always done isn’t necessarily the right thing to do. The world has moved on and HE seems to be the last bastion of resistance to changing practice. Opening up ideas and minds to the potential that we can teach and learn differently using technology and developing digital literacies skills to be more effective and efficient is what I am trying to do at Southampton. We had a fantastic conference on March 8th, ‘Open Badges in HE’ (I wanted to call it BadgeCon but there you are) at the University of Southampton. Over 150 people attended in person, and 100 online, from around the world. We were very fortunate to have both the UK and US perspectives on education using Open Badges with our keynotes, Doug Belshaw and Carla Casilli. Both highly respected in the badge and education world, so it was a real honour to have them talk to us about the application and implementation of open badges in higher education. We have captured a lot of what went on during the day via Storify and the iChamps are blogging about it. It’s always after the event that the real conversations get started and I have already been talking to a range of people across the university and beyond, interested in how they might implement badges into their own practice. It got me thinking about how everything that I am involved in revolves around digital literacies skills and competences. In the last few months since I wrote my last blog post I have been here there and everywhere, but the underlying theme of the work I do, the research I undertake and the conferences I speak at, have always been digital literacies. The importance of being able to work, live and learn effectively cannot be understated and I always bring it back to that one area. Don’t ask people to run before they can walk. If you are interested in implementing new curriculum support your staff and your students (or your customers and employees) to inform themselves of the concepts of digital literacies. Why is this important? Don’t just assume they can or they know how to use hashtags, or that they will grasp concepts if they are not engaged in the global world. I’m trying nor to use the phrase 21st Century skills (its 2016 folks) we have entered that space. So, before you think about implementing a new concept or idea think digital literacies. What are they? Many before and after me will write reams about what they mean but essentially it is about communicating, creating, collaborating and critical thinking, with a bit of citizenship thrown in (lots of C’s). Being digital literate isn’t a state that you will arrive at and tick a box saying ‘complete’. It is something that is forever moving forward and is part of the life long learning set of skills, bring on the key phrases around agility and flexibility, being rigid and inflexible isn’t going to be an enabler to becoming effective and efficient in a global world. I have been remiss in recording where I have been talking and where I will be going over the year (2016), as I keep being asked I thought I’d give a little synopsis of where I have been and where I am yet to go. My conclusion is that I am up to quite a lot, but it’s all good and useful for the work I do at the University of Southampton. I gave a keynote to academics at the Open University in Milton Keynes. I was talking about interesting and innovative solutions to common issues using technology enhanced learning. The talk was entitled ‘Action not words’ just because the idea was that active learning was the key issue. These are my slides, not always useful because I use a lot of images but I have been asked for them anyway. JISC Stakeholders forum – I was invited to this as part of my role for ALT. This is interesting because I gain a perspective of FE, HE and also other education providers (apprenticeships etc) which is always interesting. JISC are very interested in supporting at varying levels and to determine what their ‘offer’ should be. Interesting times. At the University of Southampton, our Student Champion Network Group are part of the HEA Strategic Enhancement Programme activity. I attended as a member of that group to meet with other partners and to hear about their activities. In particular it was good to hear about other student partnerships as well as internationalisation projects. I also go to meet Sam Elkington who is the Academic Lead for Assessment and Feedback. We had a chat about incorporating technology enhanced learning into activities and what we are already doing with open badges. The Story – Stephan Caspar, Media Lead in ILIAD at the University of Southampton invited me to go to this innovative event. It was very diverse and held in Conway Hall which is a great venue. We heard from podcasters and archivists, including Wolfgang Wild and Helen Zaltzman (Podcaster). They even had Werewolf biscuits. ALT Committee meeting (London) – I love these because everyone is committed, enthusiastic and very positive. We had an interesting talk from a director of the Tinder Foundation (the training people not the dating people!) This activity fits very nicely with work I am involved in at University of Southampton, which is so often the case with ALT. Big Bang Data exhibition – this was an educational trip for the iChamps to see how data can be visualised and hopefully bring to life some more of the technical implications of how we use data. It was very interesting and was part of their CPD for their roles as champions of digital literacies. I was a speaker for Inside Government Conference ‘Designing and Delivering a Quality Higher Education Curriculum’. In particular my talk focussed on the value of digital literacies skills and how the use of students as partners for this development is important. Everyone loves the open badges at the moment and we use it to gather evidence of activities. I met Professor Peter Lawler from Manchester who talked about their University College Curriculum Innovation model which is really nice. There was a lot of interesting and useful talks, and a lot of interest in our iChamps. Biennial International Conference on iPads in Higher Education – I am a speaker for this conference in San Francisco from 16-18th March. I am going with Judith Lock and iChamp Charlie Cosstick. We are all presenting papers on the use of iPads with the iChamps and for the projects that they work on. I will be attending my residential for my PhD in Lancaster Uni at the beginning of April. That will be great, I finally get to meet the other students on the programme and I have never been to Lancaster before (it’s a long way!). I’ve been invited to talk on behalf of ALT as a special keynote Inside Government conference on transforming learning with mobile technology in London. On the same day I am attending the Apple organised mini conference in the pm back at Southampton. This is focussing on the use of iPads for medical education. The Disruptive Media Lab (I love that name) in Coventry University have asked me to come along and talk at their conference. I think we are planning to present together so we can cover Open Badges. So that’s going to be fun. There are ALT meetings and also I have been invited to be keynote at a technology enhanced learning conference at the University of Portsmouth. The programme looks brilliant and I am really excited to go along and talk there. I haven’t been there for a very long time so it will good to go along there again. I think the last time I was there was for a Second Life event which tells you how long that was. I have just had a paper accepted for a conference on ePortfolios and experiential learning in Edinburgh in June. That will be awesome. I am hoping that my fellow colleagues from the University of Southampton can come along as well as I have submitted the paper about our project piloting the use of Open Badges and ePortfolios. The conference is still accepting proposals, and looks like it will be a busy three days.